If You Think Music Was Invented In Virginia | Cover Story | Style Weekly - Richmond, VA local news, arts, and events. Well, in some cases, you're right. There are all kinds of reasons to make music here in Virginia, all kinds of ways to express joy and sorrow, tell tales and reel in fish. Each of these bands came together for a purpose  be it love, work or fiddlin'. Sounds Like: Church music with a lot more twang. 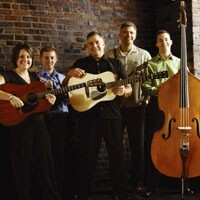 Why you should see them: Who doesn't love a love story set to extremely tight bluegrass? Kenny and Amanda and the band bring together flat-picking, mandolin, harmonizing and some Alison Krauss vocal work for a large and varied sound. When: Friday, 7:30 p.m.; Sunday, noon, 5 p.m. Sounds like: A good way to kill time while fishing. Why you should see them: The choral singing group keeps alive the kind of song vaguely related to sea chanteys of yore. These African-American work songs came out of menhaden fishing and were a necessity for black fishermen to synchronize the retrieval of big nets of fish, to work as a single muscular and musical entity. When: Saturday, 4:15 p.m.; Sunday, 2 p.m. Sounds like: A good way to kill time while building a railroad. Why you should see them: Like the fishermen chanteys, the call-and-response bar-gang songs were a way to kill time as well as to organize movements while laying track, complain about bosses and stir up some laughter. All the while, they capture the history of the evolution of transportation in America. Sounds like: What people were dancing to before DJs came along. Why you should see them: Galax apparently sits on the mother lode of musical inspiration, as mountain music has been coming from those hills for years. The Bogtrotters capture the energy of a barn dance, with jangling banjos and the kind of string sound that helped refine country music some 80 years ago. When: Saturday, 2 p.m., 6 p.m.; Sunday, 4 p.m.